In an attempt to compare the NPS ratings of Salesforce and HubSpot CRM, we ran a survey for both. Unfortunately, none of the small business owners we surveyed were using Salesforce. Most were using HubSpot CRM, while only a few were using something else. The NPS for HubSpot CRM was a ridiculously high 87. 17 of the 23 respondents were executives or sales leadership in their firm. All of them had less than 50 employees with 12 of them having 11 or more. Favorite Part: “HubSpot is by far the easiest-to-use CRM. Salesforce is a robust platform and built for the enterprise, and priced accordingly. HubSpot has a free version and a pro version. The decision to switch was simple for me. I was spending close to $10K per year on the Salesforce CRM and moved to HubSpot Free and found little to no tradeoffs. As we’ve upgraded our users into Pro for the Sales tool, there is no comparison in terms of what it does. I suppose Salesforce could do the same kind of things, but not out of the box. HubSpot CRM plus the HubSpot Sales tool has awesome Gmail integration, notifications, sales templates, timed sending, sequences, meetings, reporting, and chat. Favorite Part: “We used SFDC for several years before transitioning to HubSpot Sales in January 2016. SFDC is a favorite of mine, but a lot of the features (and price) were overkill for how we use a CRM. Making the switch made perfect sense for us: it’s free, easy to use (very important for less tech-savvy sellers), and the marketing data integration is seamless. Favorite Part: “It’s really simple to use for an individual or for a team – even those who haven’t used a CRM before. It is also versatile enough to be used as both a sales tool and a job management tool post-sale. Providing proper notes are kept and processes are followed, any team member can see what is happening with every prospect and customer. When a customer calls, we have a complete history of our interactions right at our fingertips. Favorite Part: “Our team started with Salesforce as it felt like the “default” option, but quickly figured out it wasn’t a great fit. 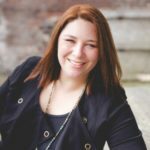 Favorite Part: “Collectively, our team has used a variety of other CRMs and we found the HubSpot CRM to be incredibly user-friendly, intuitive, easy to customize, and to have a high adoption rate. It’s easy to get a team up and running on it quickly and it really helps the salesperson improve their sales process. Favorite Part: “Because it’s easy to use and setup, and the data from it is actionable. It’s good for businesses that are just starting out, and with all of the integrations it’s really a great tool to actually help you manage a sales team. And, because it’s easy to use, sales people are more inclined to use it because it actually helps keep them organized versus being a chore for them to use, which leads to bad data, and a useless system. Favorite Part: “Our agency is incredibly happy with the HubSpot CRM! We use it ourselves and recommend it to most clients. Having used Salesforce in the past, I find the HubSpot CRM to be more intuitive, easier to set up, and a more enjoyable experience overall for day-to-day users. The features that have helped build Salesforce to the huge force that they are today, are the same features that often make it ill-fitting for growing small to medium size businesses. Everything has to be custom-built, from reports to contact properties, which is out of scope and budget for most. Price. 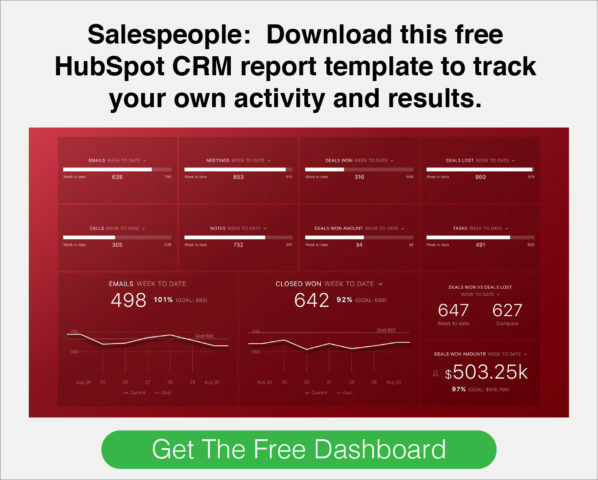 HubSpot’s CRM is free. Integration with existing email systems to auto-capture and organize communication between customers and employees. Integration with the HubSpot marketing tools that allow salespeople to easily find their best leads and know how their leads are interacting with their marketing. Integration with HubSpot’s sales tools and how HubSpot’s Sales tools help salespeople more easily do their job. At Databox, we’re happy users of HubSpot CRM and HubSpot Marketing too. They are brilliant together. We’ve even taken the extra step of integration our app with the HubSpot CRM, so that we can segment our users, customers and partners more easily. It helps us market, sell and service from one common database. As a HubSpot Premier Connect partner, we’ve also invested a lot of time and effort helping HubSPot CRM users monitor and report their sales activity and results. All in all, we’re super fans. 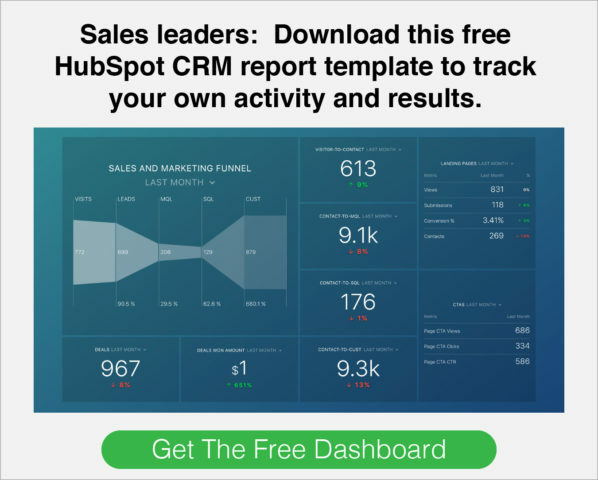 Are you using HubSpot CRM? Did you choose Salesforce or something else? We’re continuing to run our survey, hoping we’ll find companies that use Salesforce and other tools. We know they’re out there. Take the survey to tell us your favorite CRM and why you love it.